Today comes the "D" Day, when we should see the wrecks. Meeting is at 8 in front of the hotel. Around half past seven we want to get out of the room, but it is impossible. The lock is blocked and we cannot open the doors. Finally Radek got an idea to use the stell holder for canister, he had with and we put the doors a bit aside with it and got outside. Uff.. The guy comes at 8, as agreed and we go. The evening before we spoke about that he could drive slowly with the tourists. Well, it was the opposite way, he drove like crazy through the sand and it was nearly impossible to catch him. After a kilometer Radek gave it up with a fear of crash, luckily there was one place left in the car. I felt good and really wished to come there on my scooter and take the pictures with it, so let's go on. The way was really hard, but possible on the new tires. It jumped on the bumps quite a lot. After an hour we finally got to the place. There are remains of the ships, still in the desert, so the hapiness was really huge! Following movie is in Czech where I speak about my dream came true and you can see the sparks of hapiness in my eyes. We made some more pictures and left totally satisfied, as the target of our trip was reached and we saw what we wanted to see. I also remembered that for terrain is better to blow off the tires a bit and did it. What happend I still cannot believe. The scooter became totally calm on bumps and now I can really fly on the sand roads. Before I hardly could catch the jeep and now I am able to overtake it anytime and have to wait for it. The way back was so full of driving pleasure that i will remember this for a long long time. We also stopped at the water where Radek put his legs in. So, we really saw everything - former shore, wrecks and water. Around noon we came back to the city, took our things and set out on a way back. We inform about train to Moscow, but we would have to wait 1,5 days with an unsure result, so we decide to go back on scooters, on the offroad tires, which we will try to drive as long as possible, as our road tires are on 15% of rubber and would not make the way home. It is a bit noisy, but still possible to drive. In the evening we arrive in the same jurta as on the way there and take an offer to overnight again. On the way we tried several truck drivers to save us the boring way, but still with no result. Full of expectations we arrive after last 3 hours to Aralsk, it is around noon and we go to the city to look around and ask, where we can find the ships. It does not take long as the people are here very friendly to tourists and they take us to the former harbour. There is one last ship that was left here to remind the past of the city. We ask for other ships, those on the former shore and were told that all of them are already gone, disassembled for steel. No! We drove here for almost 3 weeks and now found nothing? There is basically nearly nothing left after the lake, only few old cranes, but no old factories for fishes, nothing..
Aralsk is basically city like many others in Kazakhstan. We found accomodation in hotel Aral, which does not only look old from outside, but from inside as well. Shower is one for the floor and internet is included, but does not work. I still don't want to give up my desire to see something more, got a SIMcard and found info about small village which is around 60kms from Aralsk, where should be last 3 ship wrecks. However, the information is several years old, but I at least want to give it a try. We change tires for the offroad ones, as there is a lot of sand around and with asphalt tires it is no chance. We are amazed from how good the tires work and can go basically anywhere we wish. The first test drive is on the former shore around Aralsk city and looking on what remained from the ships here after they had been dismantled for stell. I found info about agency that organizes trips around and wrote them email. After few minutes I got a reply with a phone number to a guy who speaks english. He confirmed that there are 3 remained ships still there and goes there tomorrow with tourists and we can drive behind his jeep, if we want to. I am so happy how everything works. We go for a short walk through the city and meet a nice guy who takes us to Saslik where locals go and it was really the best barbeque meat we have ever eaten. In the evening I struggled with Internet connection, that stopped working even on my cellphone, but we anyway go to bed looking so much forward to tomorrow. Today 500kilometers straight away, otherwise very boring. We are so lucky with the weather, there are clouds and temperature does not exceed 30 degrees, which is great and our big fear from the sun and high temperatures has not come true. Sometimes, we have to slow down because of the camels next to the street. Again, we had fun with Police, they stoped us asking for “kluč.” Later we realized this is the key number 14, which we provided and they gave it to a guy, who was stopped with sume junk car and was fixing their police SsangYong. Then, they asked for some little presents, so we gave them stickers and keyrings. When the work was done, one of them told us they will give us a present too. Then, he took off his reflection vest and gave it to us. What a surprise! On the way we have a strong wind against us and today is really extreme. In the worst place we go full throttle not more then 65kph, so the way goes slowly.. In the evening, there are only last 200kilometers left to Aralsk! We stop at the lonely restaurant in the middle of nowhere where the owner lets us oversleep on the floor in the typical Kazachian jurta. People here are excellent, all the time horning, wavig and speaking to us. Really nice.. I would summerize this day: We did 700 kilometers with 2 junctions, which we did not miss :) Otherwise pretty boring, but we need as many kilometers as possible. We had a bit of fun with the Police, which stopped us and said that my light was off. I said it is next to impossible, as I did not touch on the switch from Russia and the Police officer said they have it on video. So, I asked to see the video. In the meantime he stopped a car from Netherlands, got in his car, came back and said his colleague unfortunately already deleted the video :) So, we could go. 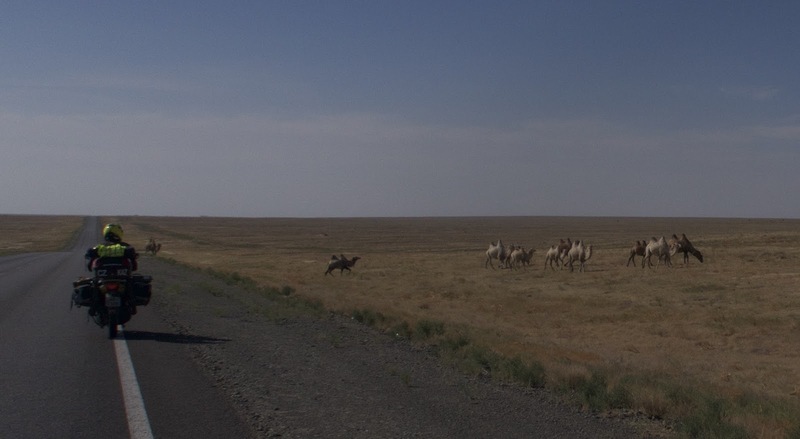 The beautiful thing on driving in Kazakhstan are the wild birds around. The feeling when a big Eagle lands next to you and then flies above your head while you drive a scooter is unforgettable. In the evening we acomodated us in a restaurant, which had directly from the pub 2 doors, one to the room where the owners family lived and another one was for us. Shower was outside and we were happy to use it. In the night Radek woke up with a strong pain in his stomach and it looked quite bad. Fortunately after taking pills it got better and we could go on in the morning. The, we go on on a road full of holes to the Atyrau city, where we wanted to decide which way to take. Original plan was to take the A-27 road, which is the shorter one. But after consulting with truck drivers and some locals it was clear that this road is managable but very hard. Imagination of another 1400 kilometers spent on such roads looked like a nightmare, also with the previous day experience. Finally we decided to take the longer route which goes through the north of the country and is 400 kilometers longer, which killed our plan to be on the Aral lake in 2 days, now we still have 1800kilometers to drive. So, we started and made the first 150kms right on the first evening and then found a place for a sleep next to the road and made it with the owner. We took out the mosquito net and went inside. In the morning we woke up with 30 mosquites inside, as the entry hole opened in the night and everybody was invited to come in and take a bite..